Condo Culture | Looking for that hidden opportunity? We’ve got you covered. Our team of condo experts tireously hunt the real estate market and gather the most up-to-date and complete database of available condo listings, including properties not listed on realtor.ca, to share with you on the web. It can be an overwhelming task when you’re not as familiar with the condo market, and most often, it can be difficult to know where to start. If you haven’t already done so, simply start here! By creating an account on CondoCulture.ca, which takes less than 30 seconds, you immediately get access to the latest availability, market updates and insight. Having a Condo Culture account also provides the ability to follow your favourite cities and buildings, which will allow you to receive updates through email notifications, catered specifically to you. You can customize these notifications if you would like to receive them daily, weekly, or even what to include, such as when a listing price change occurs or is removed. Signing up is a quick and simple three step process. For the first step, you will just need to fill in some personal information. Name, email, phone number and create your password. BAM! You’re registered for exclusive access. You will then receive a confirmation email to get started right away. Step two. Now the fun begins! By utilizing the Condo Culture website, this helps you narrow in on your favourite buildings, listings and neighbourhoods. You can follow your favourite listings and buildings for important updates. At the top right of each page, you can select the heart which then automatically saves to your personal dashboard. Go crazy, choose all your favourites and don’t miss an opportunity. 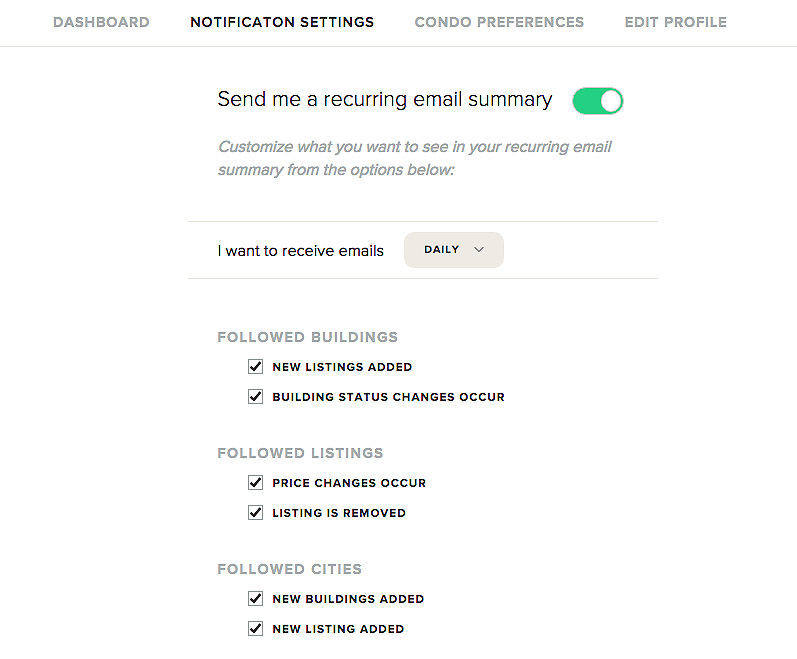 Don’t forget to set your condo preferences within your Condo Culture profile. We have made your search that easy for you. Simply check off your desired size, price point, number of bedrooms, number of bathrooms and whether you are looking to buy to live, buy to invest, renting, selling or just want to stay updated. We got you covered! Step three. Book a tour through your account. It’s quick to set up a tour and we cannot stress enough the importance of booking a tour. You can see your favourite listings and get insider insight from a true market expert who knows the building inside and out. Our ultimate goal is to help you find the perfect property. With the market being constantly active, having an account set up enables you to receive notifications about the newest listings and price changes. You can compare different condo fees, availability and sold prices building to building to determine the best value in the local market. You can also use our advanced analytics to help you understand how quickly, how often and how much units are selling for. But remember, to get this exclusive access, you need to register here! So before you go on with your weekend, follow the link below, sign up and start favourting. Cheers to the weekend, everyone!